With 11 inches of rain in March local rivers are running high and dirty. 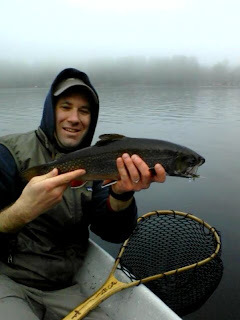 I was on the Sheepscot Friday and it was high with tough fishing. Scott was on the East Outlet yesterday, it was running at 1100 CFS, but no fish. Yesterday I hit a local spot where the smelt are running and found this fat 19" brookie willing to take a 6x long smelt pattern stripped quickly just under the surface. It may be a few days before water levels come down fishable levels on the rivers and streams. For now the tribs that dump into ponds and lakes are going to be a safer bet.